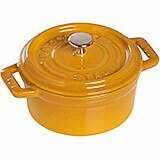 These items have been discontinued by the manufacturer (Staub) and are no longer available. Please call us Toll-Free at 866-482-8919 for alternate models or solutions. 5.2" X 4" X 2.5"